Every town has something that makes it unique, but ultimately not all towns are created equal. Holland, Michigan is one such example of a town that outshines the rest. 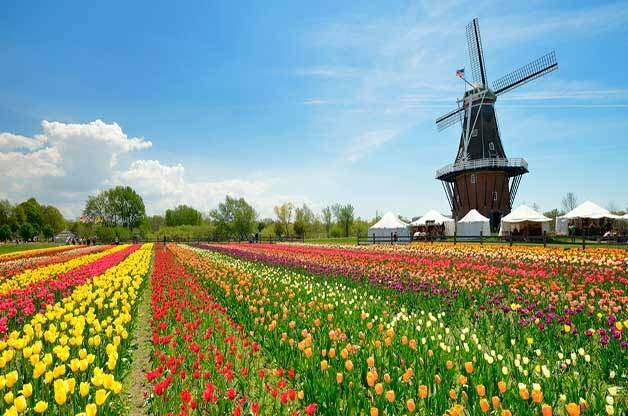 Year after year hundreds of thousands of tourists make the journey to the majestic Great Lakes State to participate in the annual Holland Tulip Time Festival and celebrate the town’s Dutch history and culture. While guests may enjoy the parades, carnivals, concerts, and more, all will agree that the most memorable sights at the festival are indeed the tulips themselves. This colorful and dramatic display has earned the title “Best Small-Town Festival,” and rightly so, as it truly is the experience of a lifetime! 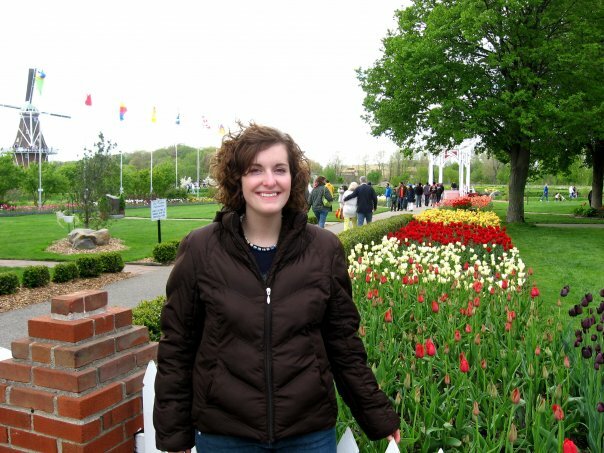 The Holland Tulip Time Festival has been an integral part of the culture of Holland, Michigan for nearly a century. It was first proposed by biology teacher Lida Rogers in 1927, who felt their town’s strong historic ties with the Netherlands deserved to be celebrated in a way that combined both locations’ natural beauty. She suggested planting tulip bulbs throughout the entire town, and two years later Holland debuted their first festival. The Holland Tulip Festival quickly became a renowned success, and was nationally known by the mid-1930’s. The people of Holland, MI are not reserved when it comes to celebrating their heritage. In efforts to create a fully-immersive experience, the Holland Tulip Time Festival stretches out over nine full days. One of the most notable events is the Klompen dancers – hundreds of locals dressed in traditional Dutch garb dancing in the streets. Authenticity has always been valued among these townsfolk; a quality that can clearly be seen from the scrutinizing detail they have put into their costumes, dances, attractions, eateries, and more! 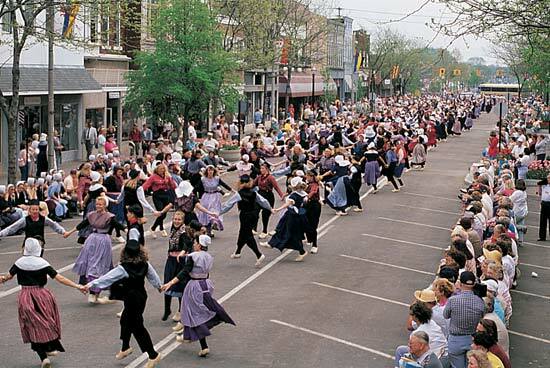 Of course, it’s not a festival without parades, and the Holland Tulip Time Festival delivers with multiple grand events, all which involve traditional sights such as floats, marching bands, and dancers. The fun doesn’t end at sundown, as this festival also includes carnivals and a stunning firework show. KC's family trip to the festival in 2009! A stroll down the famed Tulip Lanes is not only breathtaking but is also a complete excursion for the senses. How something can be both so leisurely and invigorating simultaneously escapes me, but the sensory experience alone is worth the journey. While here, be sure to take a moment and pause amongst the tulips. Close your eyes and focus on the scene around you. The gentle warmth of spring brushes your cheeks as you recognize the sharp clacking of wooden clogs on the streets nearby, followed by the swishing of scrubbing brooms. Across town, the distinctive clicking of Friesian horses can be made out as they proudly prance their way through a parade. In the distance, the creaking of De Zwaan, an authentic Dutch wooden windmill, is heard as it lazily turns under the bright blue sky, a beautiful reminiscent of the days of old. As you turn to face one of the many nearby Dutch-style eateries, the tantalizing smells of elephant ears and croquettes waft by. The breeze shifts and brings with it a pleasantly light but distinct floral scent that permeates the entire city, lingering behind in every nook and cranny. Opening your eyes again brings thousands of dotted splashes of color back into focus. A mere portion of the five million tulips blooming throughout the town of Holland gently sway before you, proudly taking claim for the enticing perfumed air. While this experience may seem almost magical to an outsider, it’s just yet another beautiful May afternoon for the people of Holland as they gleefully enjoy their annual festival. From striking, vibrant colors, to serene, soft tones, tulips offer an exciting amount of versatility. Their colors can range from the traditional bold reds and delicate pinks to stunning deep purples that are almost jewel-like in nature. As with many flower species, different colors have come to represent different emotions. The classic red tulip represents love, while white symbolizes forgiveness and yellow symbolizes cheerfulness. Pink, another classic tulip tone, has a more diverse meaning than the rest. Pink tulips are a symbol of caring, attachment, good wishes, happiness, and confidence. This makes them perfect to give to friends, family, or to take home for yourself. Inspired by the Holland Tulip Time Festival, Northern Nail Polish created a nail polish that perfectly captures the essence of a pink tulip. Bring one home for your mother, sister, or friend (or just keep the bottle for yourself – we won’t judge). It’s a beautiful, wearable reminder of the wonderful memories created at the Holland Tulip Festival. About the author: Taylor Smith is a graduate student majoring in Biology. She is passionate about science, the environment, promoting animal rights, and reading novels.